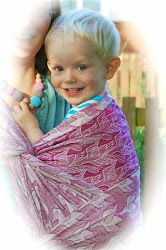 Having already been lucky enough to have a few of Little Fellows' handwoven wraps in my collection, I was intrigued when I heard that Lisa was planning to start a range of machine wovens. 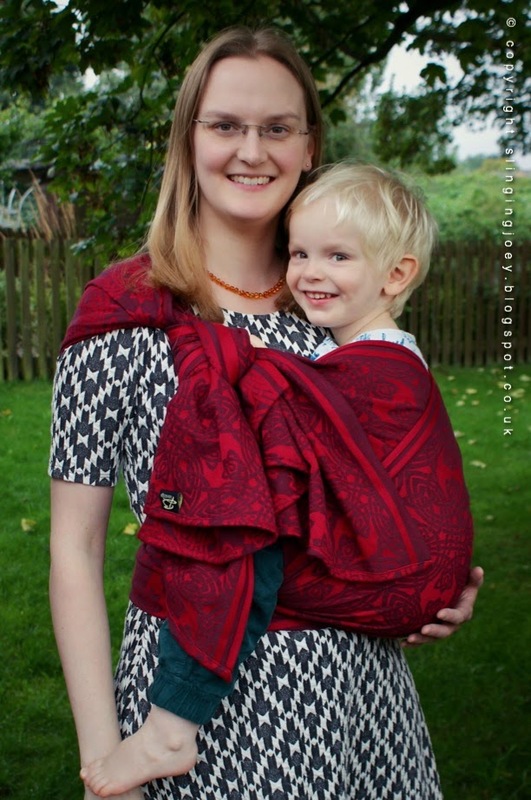 These machine woven wraps, known as the 'Jolly Good' wraps, are woven in a plain weave, and have so far been released in a couple of different colourways. As a Harry Potter fan, I couldn't resist bringing home 'Expecto Patronum'. 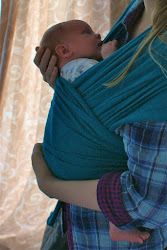 My first impression on arrival was it was lovely and soft and had a gorgeous drape. It felt slightly slippery in hand, and the weave felt fairly lose. 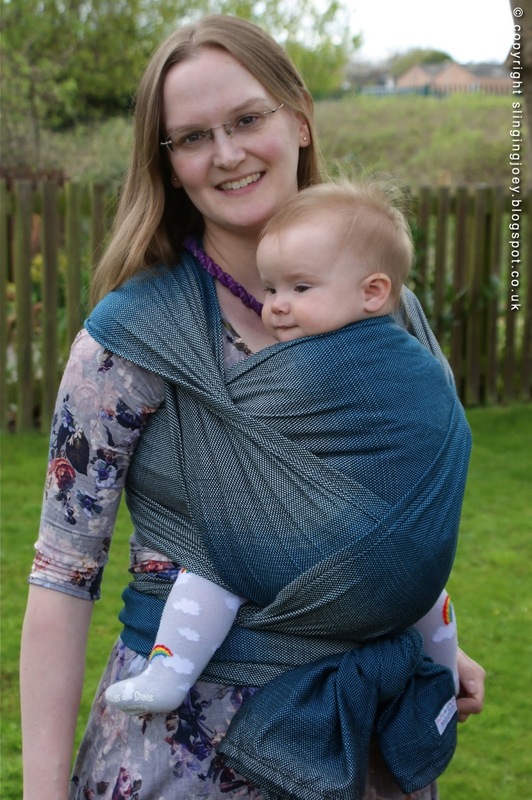 After its first wash, the weave tightened slightly, it lost a little of its slip, and I was left with a beautifully soft and mouldable wrap, with a lovely amount of glide. 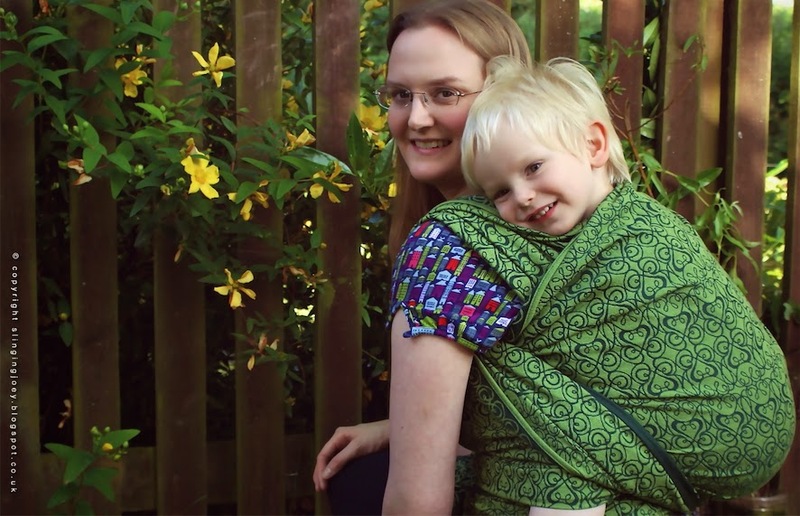 The wrap is easy to use, and is particularly easy to tighten, especially when pulling a second pass across in a Double Hammock. It supports the weight of my 9 month old well, with enough mouldability on the shoulders to stop it digging in, but without sagging under her weight. 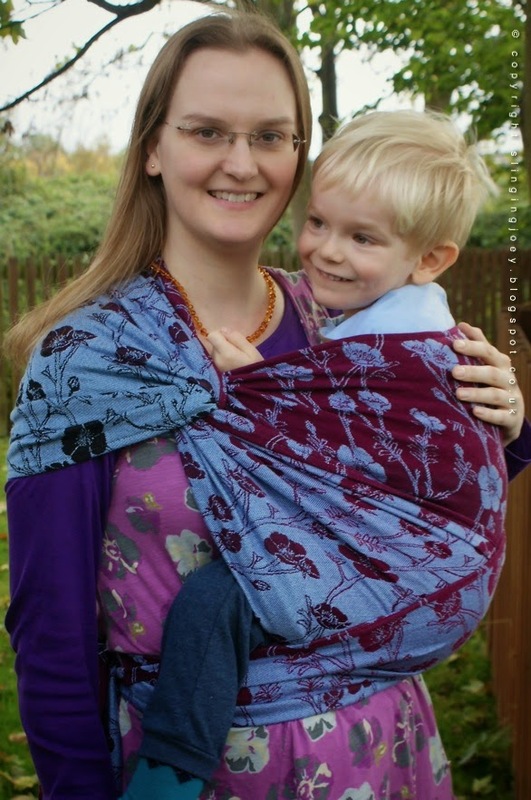 I've used this wrap extensively over the last few weeks, and I'm really impressed! The beautiful deep shimmery colour, which fades seamlessly from a petrol blue to a silvery grey along the length is simple and classy. 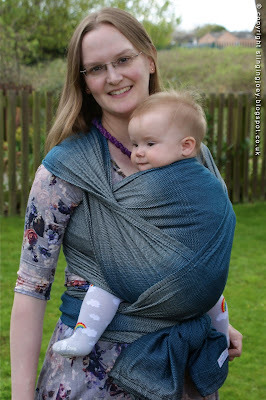 The wrap feels light and easy to handle, and on the odd occasion I've noticed it slightly loosing its 'bounce', I've given the wrap a quick wash, and the weave has tightened up nicely again. 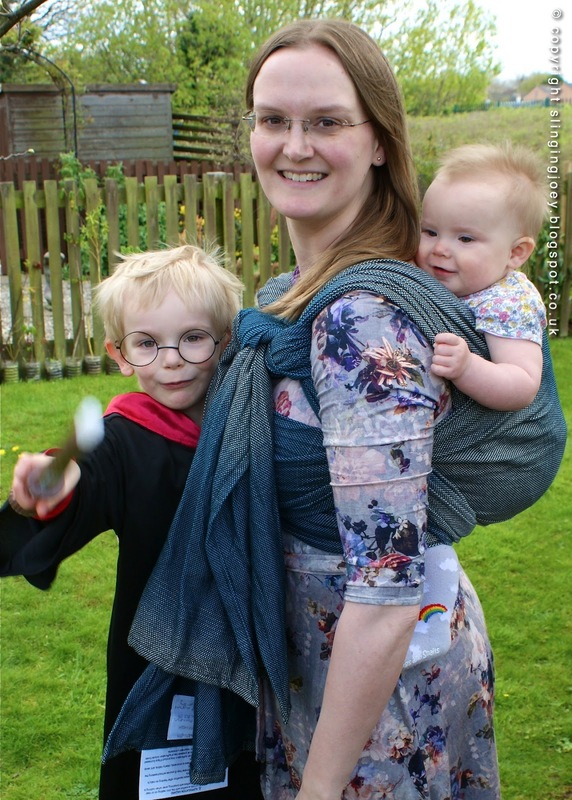 It proved it could handle larger weights when we were out last week and my large 4 and half year old son became distressed, so my husband wrapped him in a simple ruck with Expecto Patronum. 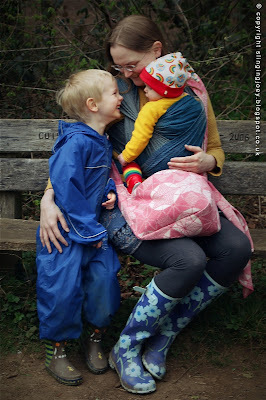 It held his weight well, and both my son and husband were comfortable whilst they navigated a steep hill. My son stayed high and tight on my husband's back even in the single layer carry. 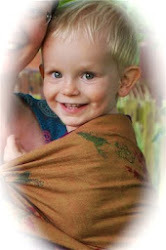 To follow the handwoven lines, these wraps come with blunt ends, and are sold in half metre sizes. Since Expecto Patronum was released, Lisa has also released 'Rainbow Mizzle', a beautiful soft pastel rainbow, and the release of 'The Chalk' is expected any time now. 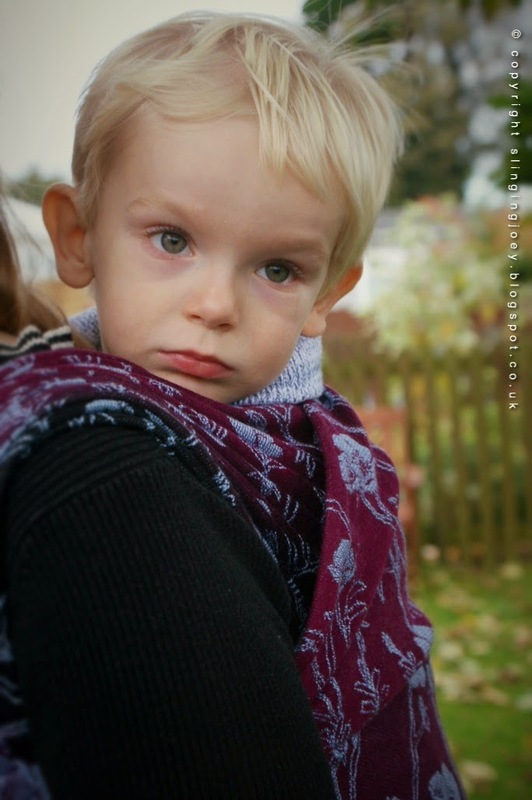 Its been a while since I've written on my blog, which is partly because my little boy is growing up, and I get less chance to wear him these days, and partly because I have been very unwell with 24 hour pregnancy sickness. 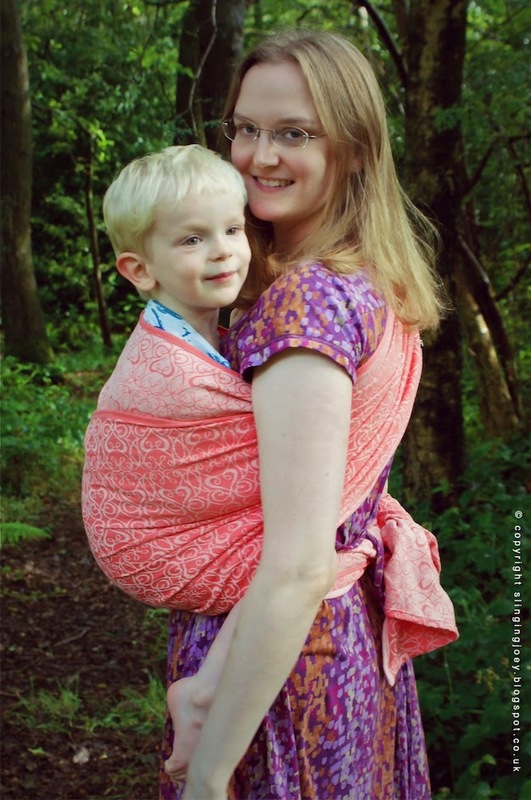 I'm delighted to share that we're expecting a baby later this year, and my wraps and slings will be put into full use again! 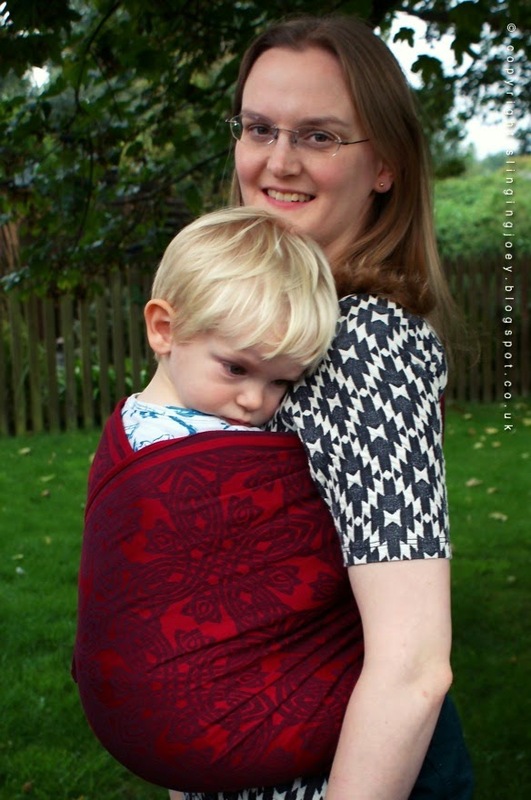 I already have a few new wraps ready for this baby's arrival, and I look forward to reviewing them here on my blog later in the year. 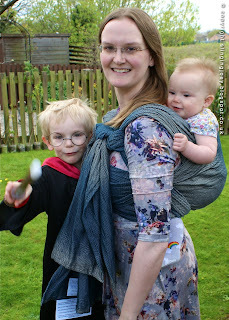 In the meantime, I've started feeling well again, and have been enjoying carrying Joey when he wants sling-cuddles. 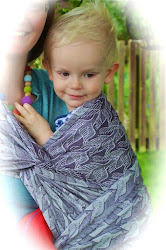 I thought I'd share a few pictures of some of the wraps we've been using recently, which will get a full review when the new baby arrives! 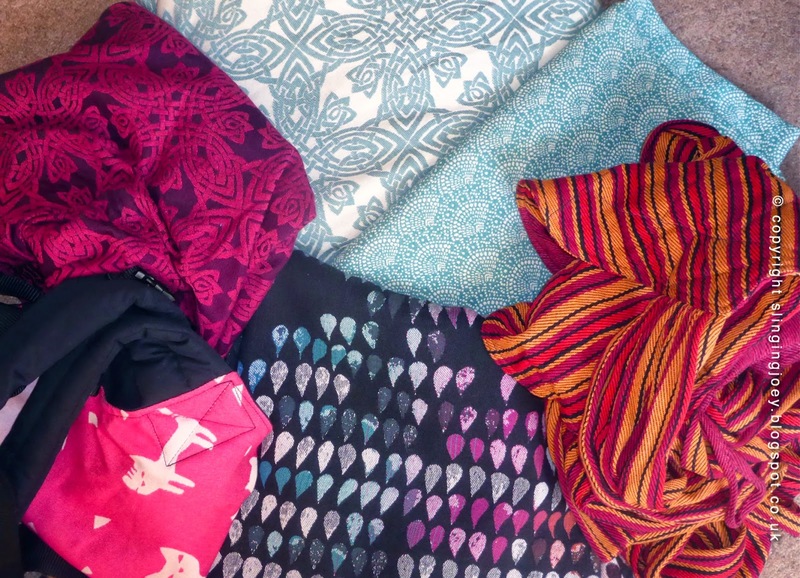 A few of the slings waiting for the new baby, clockwise from top left: Baie Slings Trowen Sweetheart (ring sling), Baie Slings Trowen Pippin (size 7), Woven Wings Spearmint Lace (size 2), Bebe Sachi Jelita Mei Tai, Woven Wings Singin' in the Rain (size 2) and Kokoro Koneko Chibi Moon Connecta. 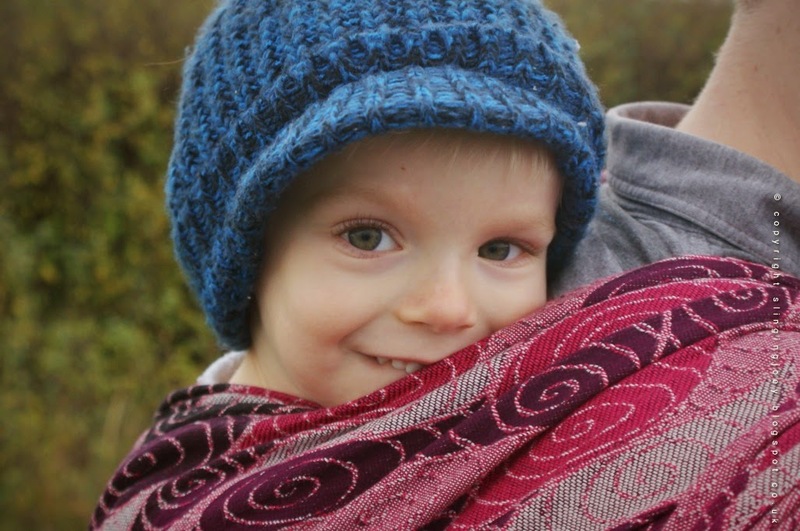 I was delighted to be asked to try out a wrap using Baie Slings' latest new blend, and having been hoping they might come up with a wool blend in time for winter, was excited to learn that this particular wrap is 80% combed cotton and 20% merino wool. Wild Roses Dew Drop (named after one of the fairies in the Nutcracker) uses the same grad warp as Baie's previous release 'Pumpkin Patch'. 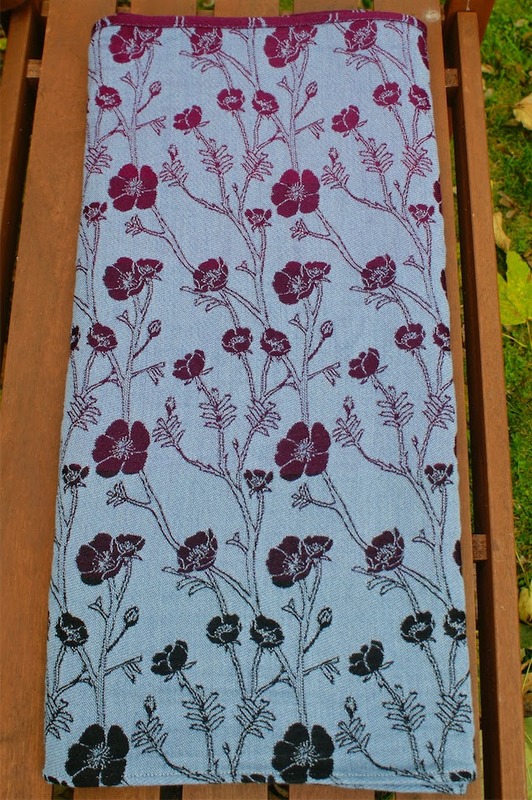 The warp blends from a bright burgundy colour to black across the width of the wrap, and the weft is a beautiful periwinkle blue colour. 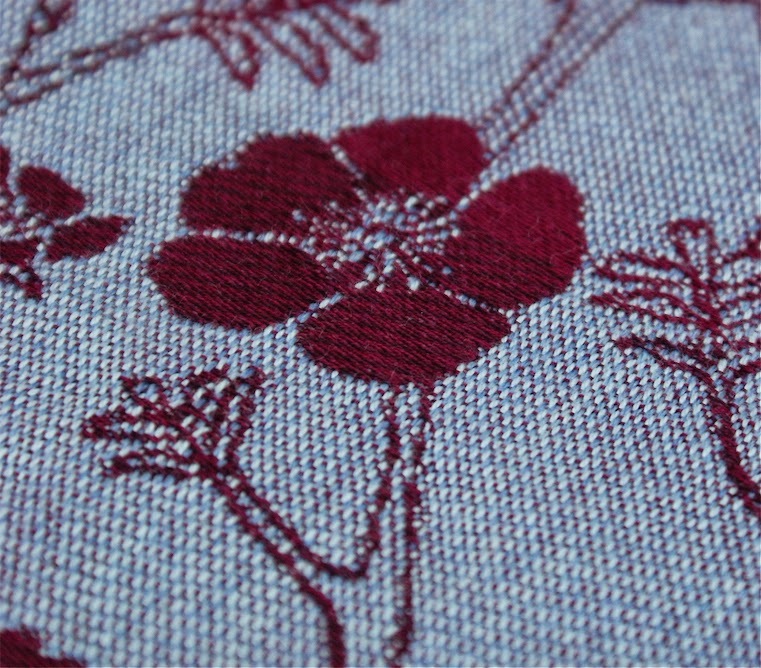 On close examination I can see this is actually created using two different blue/grey colours in the weft, which blend together to create the pretty periwinkle colour, and give the colours added depth. The two different sides almost look like two different wraps, and the grad looks equally good on each side. 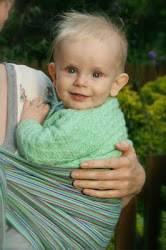 As expected from Baie Slings by now, the wrap arrived feeling extremely soft and mouldable. In fact, when the postman handed over the parcel, I could feel how cushy it was through the packaging! Dew Drop isn't overly thick, and is extremely easy to handle. It has an amazing glide to it, and it easily moulds around you both. Despite not being overly thick (weighing in at 254gsm), Dew Drop has an amazing amount of cush. 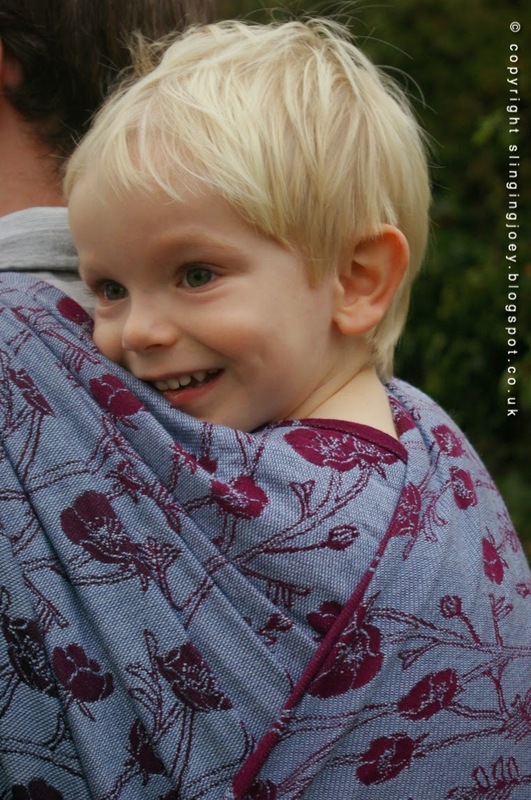 It uses Baie Sling's plush weave (meaning it is a slightly looser weave), and is totally comfortable and supportive with my tall almost-3-year-old. 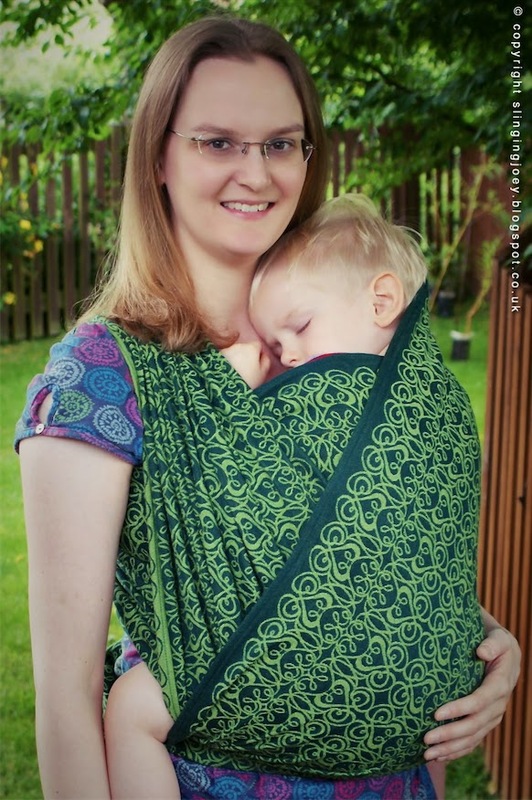 This wrap really excels in a double hammock, as the passes glide across so easily, making it easy to tighten, and the cush on the shoulders adds to the comfort. 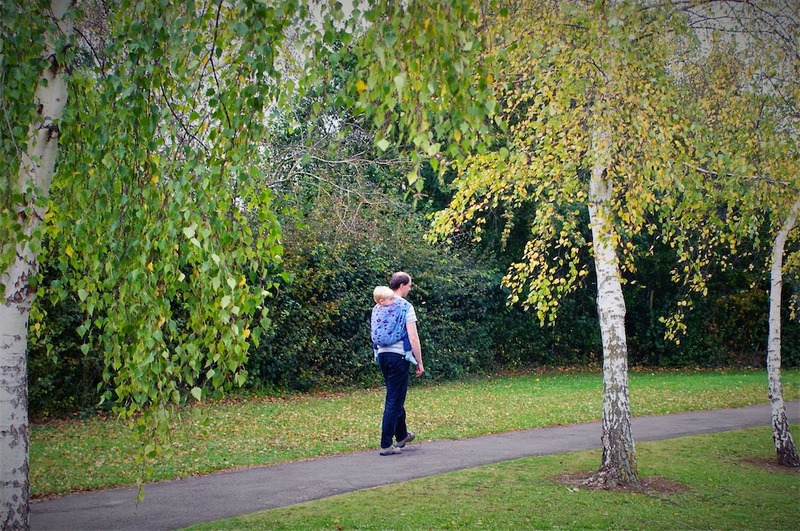 Dew Drop has also been 'daddy tested', and during an afternoon stroll, Joey stayed nice and high on my husband's back, and both were happy and comfortable. 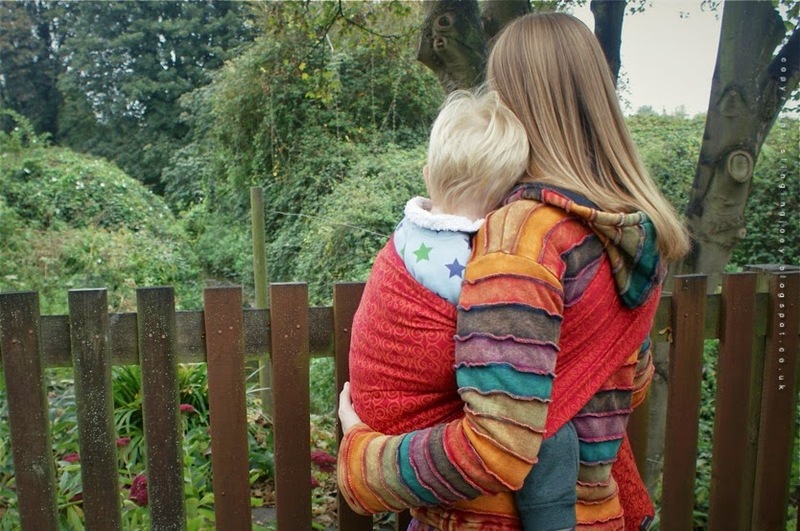 Dew Drop has none of the itchy feeling often associated with wool blends - it simply feels soft and snuggly, and would make a lovely snuggly blanket when babywearing days are over. 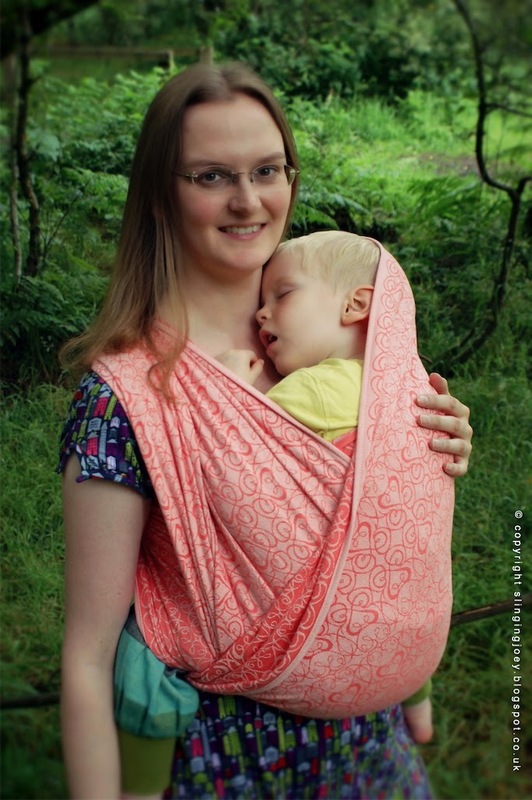 Wild Roses Dew Drop will be released in early to mid November, although anyone heading to the Carry On London event this weekend will have the opportunity to give this wrap a test run for themselves! 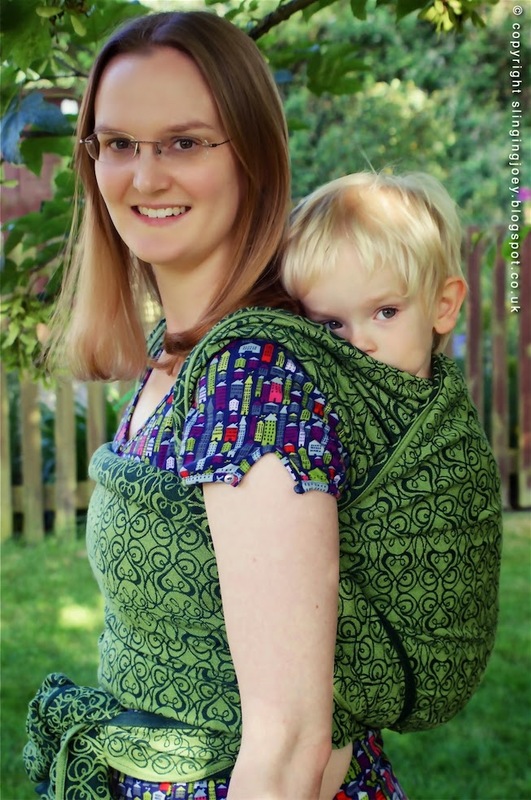 Size: Ring sling, gathered shoulder. The weather has suddenly turned colder here in the UK this week, reminding us that autumn has arrived and winter is on its way. I have always loved the rich colours in autumn, and we have a small collection of Japanese Maples in our garden, which at this time of year are vivid shades of red, pink and orange. 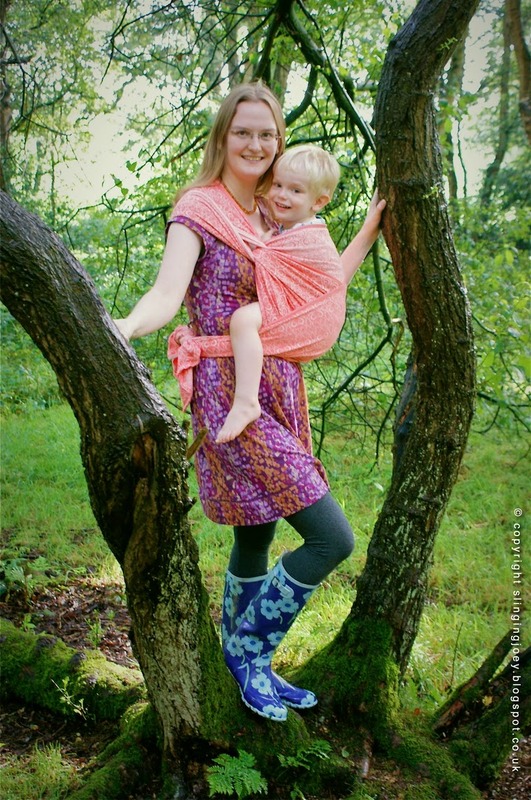 When I saw the preview of this beautiful Baie Slings wrap, it immediately reminded me of the colours I love in autumn. 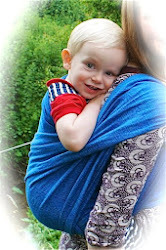 I couldn't resist adding a ring sling to my collection! 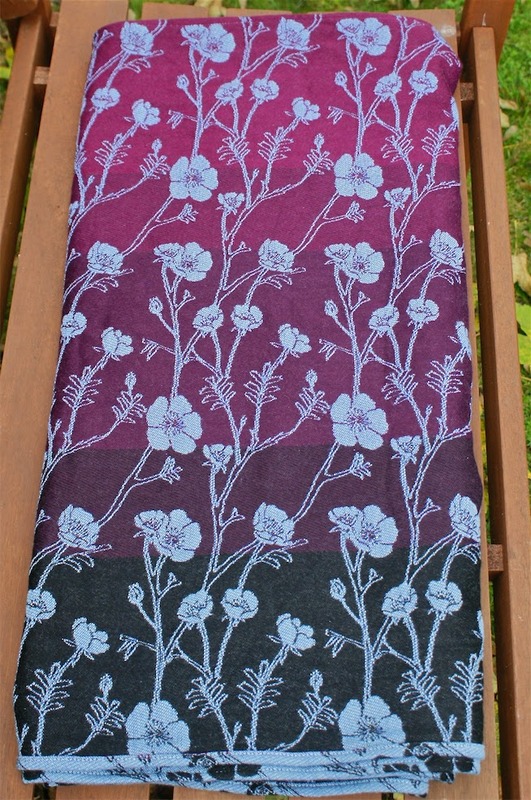 When it arrived, I immediately loved the colours even more than I did in the pictures. The red is a deep red, combined with the orange colour, and a gentle shimmer when it catches the light, giving it an amazing warm glow. 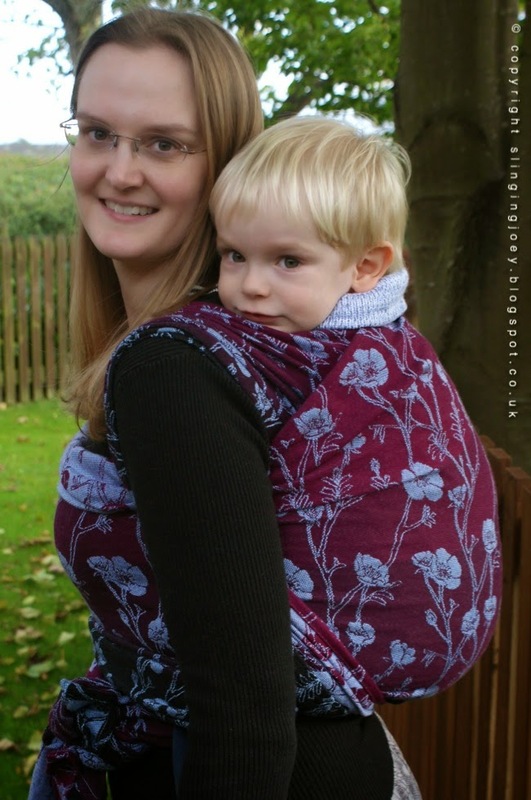 As is usual for Baie Slings, Autumn Leaves arrived feeling soft and cushy, and very sturdy. It is soft and mouldable, and is continuing to soften with use. 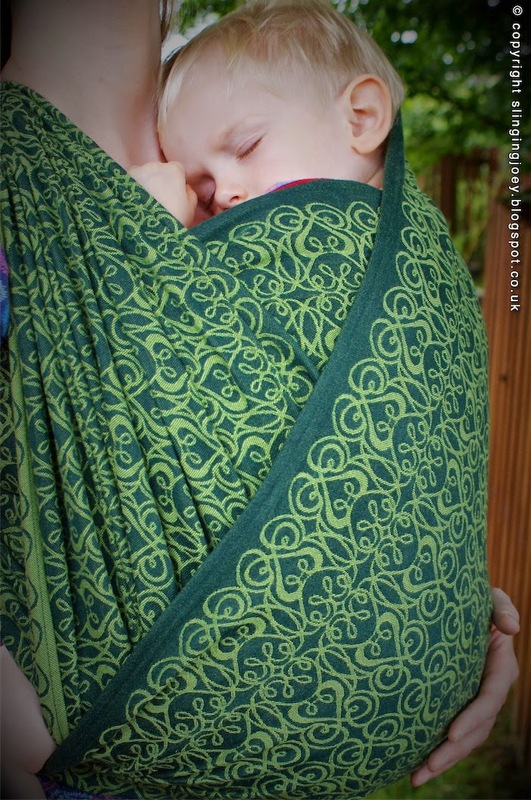 The Filigree pattern is slightly textured, but this doesn't stop the wrap adjusting through the rings easily. 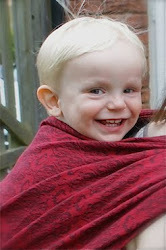 The weave is tight enough to prevent any sag, even with my large almost-3-year-old, and feels very secure. 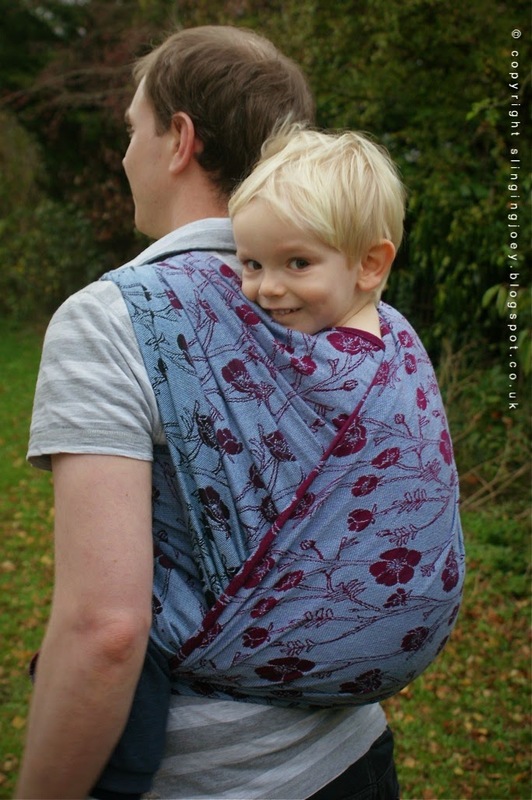 I've found it very comfortable on a couple of lovely autumn strolls, and my son seems happy in it as well. 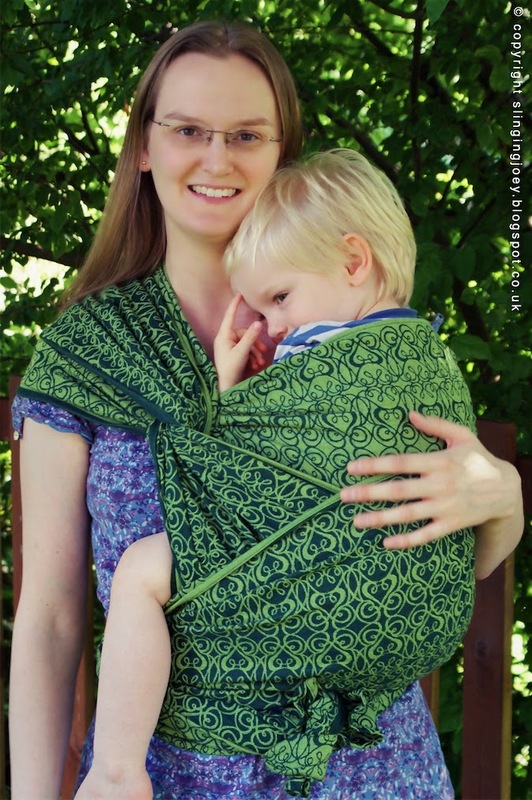 Comparing it to a couple of Baie Slings' previous Filigree releases, it feels slightly sturdier than Persica, but more mouldable than Limerick. 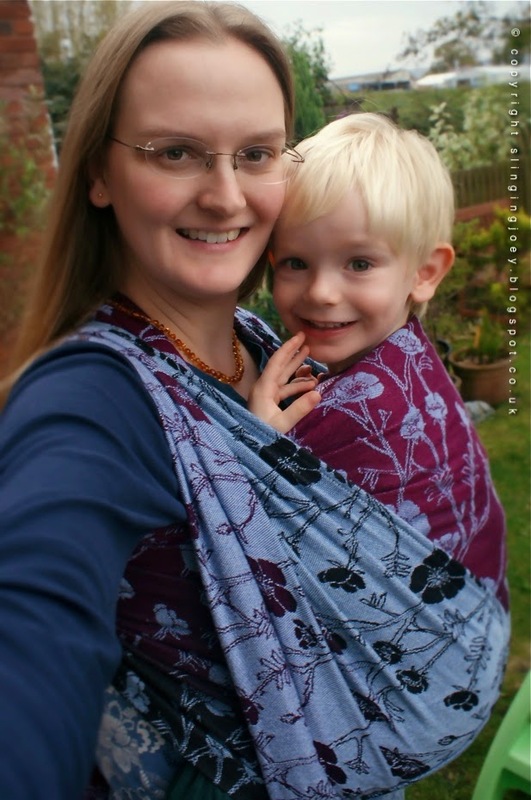 It works beautifully as a ring sling! 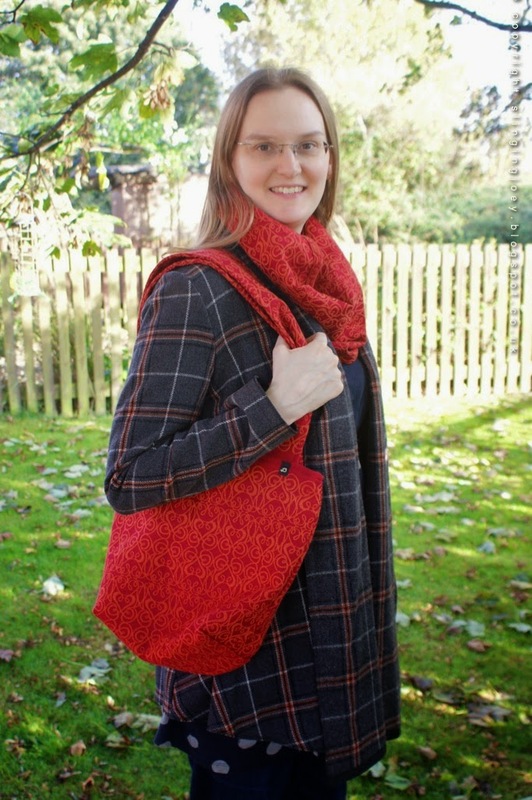 I thought it was worth mentioning the beautiful handmade bag I bought from Baie Slings, also made out of the Autumn Leaves wrap fabric, as I am really impressed with the quality. 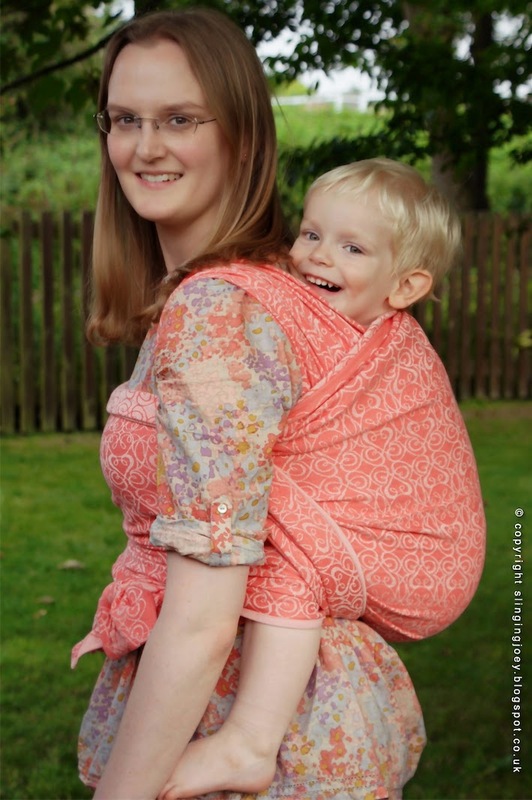 It is the perfect size for a few baby essentials, without being over-big. 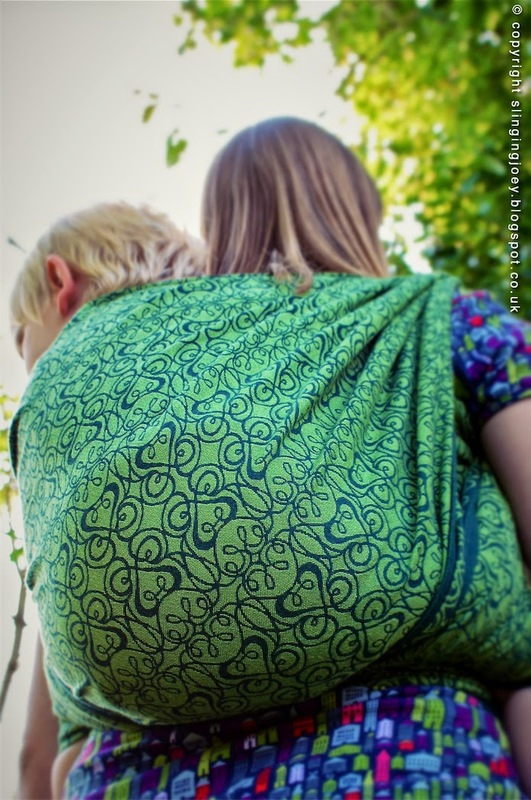 It has a zip along the top to keep your belongings safe, and the inside is fully lined. It is very professionally made, and I wouldn't hesitate to order a bag again. 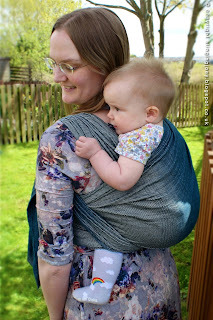 It is very practical and sturdy at the same time as being really beautiful. Colour: due to the shimmer on this wrap, I have struggled to get a perfectly accurate picture of the colours. 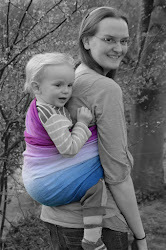 The pictures on Baie Sling's own website are more true to life than my pictures here. 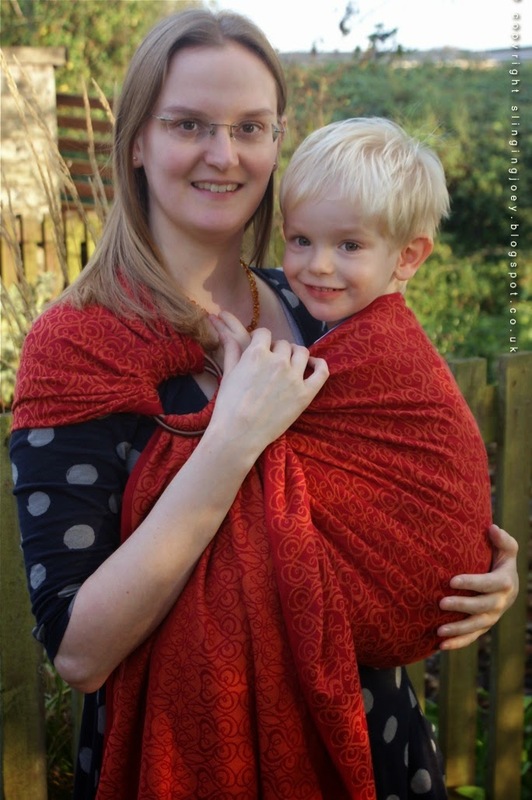 This elegant wrap arrived a few weeks ago, and we've been using it regularly since then. 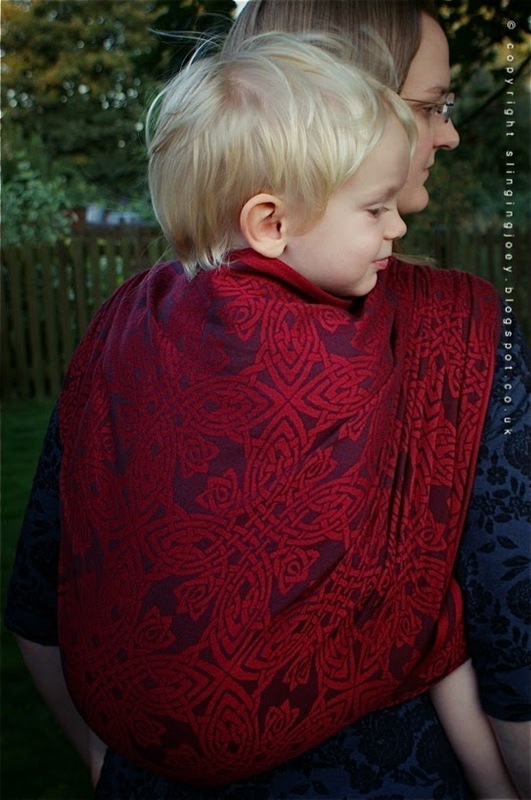 A combination of red and purple, Scarlett is a beautiful wrap, with enough contrast to see the intricate Trowen pattern, whilst remaining subtle and elegant. 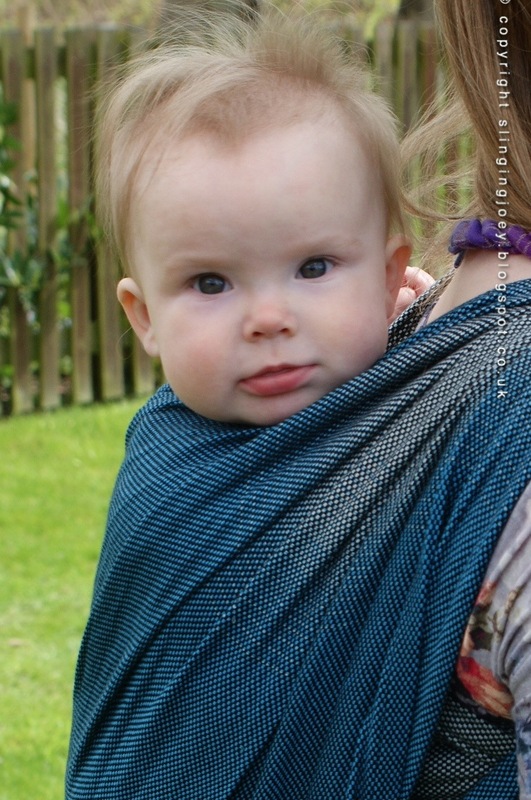 Scarlett is one of Baie Slings' tighter 'snug' weave wraps, making it smoother and denser than my other Trowen wraps (apart from Trowen Nightingale, which is also a 'snug' weave). 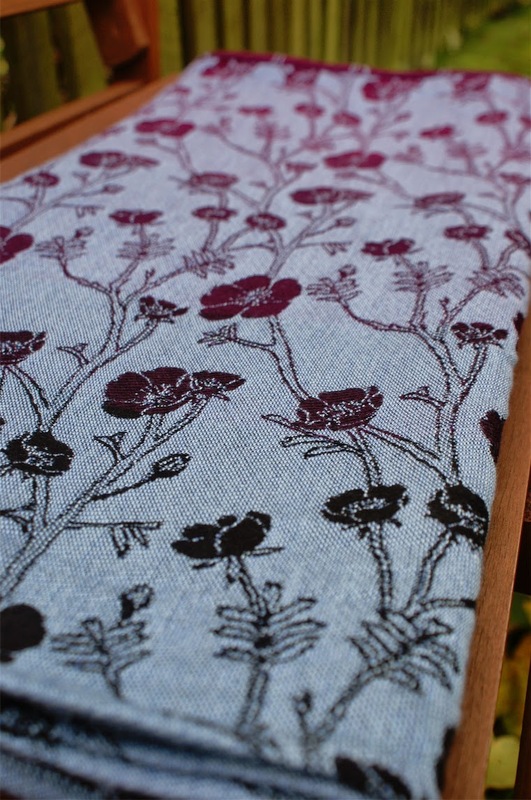 It has a small amount of texture to hold the wrap in place, but also has a lot of glide making it easy to wrap with. 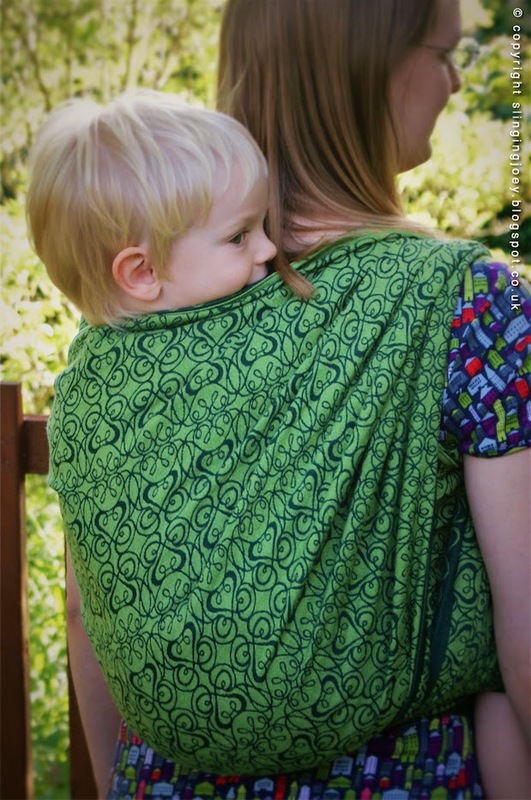 It arrived feeling soft and ready to wrap with, and has continued to soften with use. 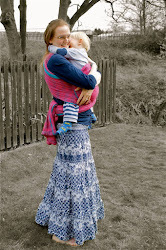 Scarlett is mouldable yet sturdy, and supports my toddler's weight beautifully with no sag. 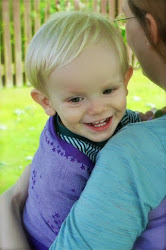 We are really enjoying Scarlett, as it is so quick and easy to use. 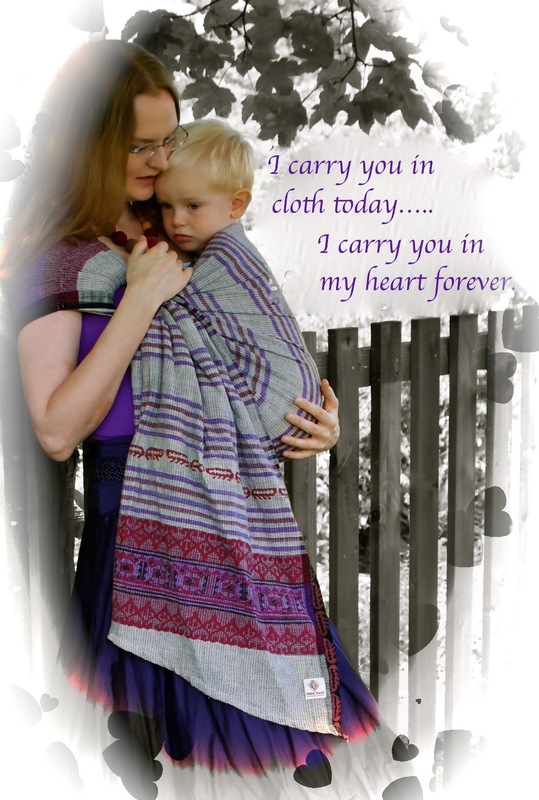 I've been using it mainly in a hip-cross-carry, which is a one shouldered carry with a slip knot. 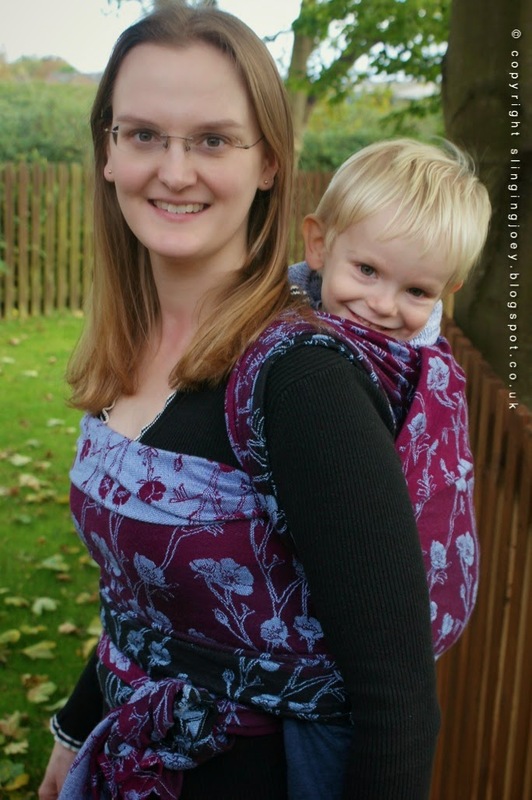 Scarlett works really well with a slip-knot, as it adjusts easily, and is very comfortable in a one-shouldered carry. 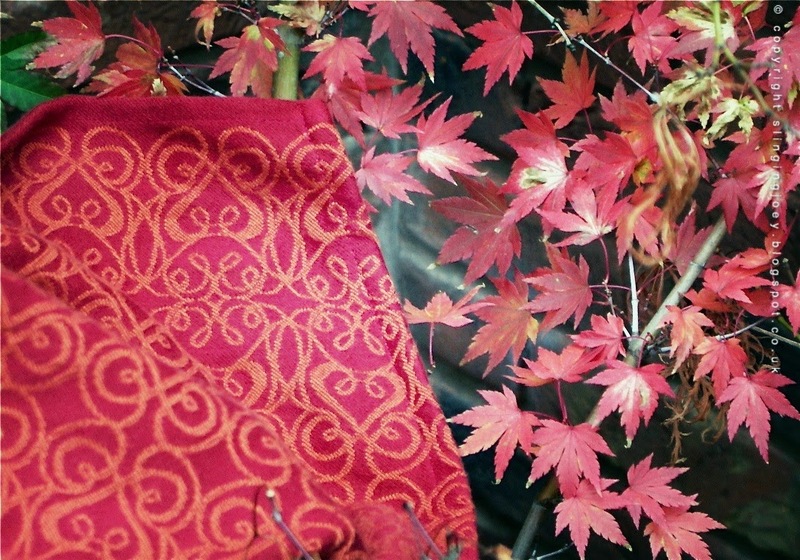 The rich colour of Scarlett is going to be perfect during the Christmas season, although we won't be saving it just for then - we will be using it all year round! A few weeks ago, the Brasserie Blanc cafe in Cheltenham became famous around the world after hanging a sign outside its door, welcoming breastfeeding mothers to use them as a pit stop to feed, and have a free cup of tea. 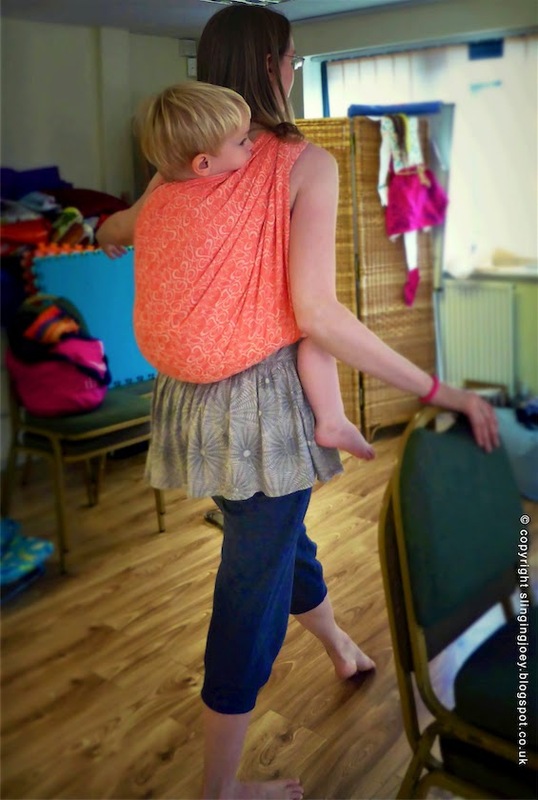 As last week was World Breastfeeding Week, Sling Beat (our local sling dance classes in Cheltenham) and Gloucestershire Breastfeeding Supporters Network teamed up to surprise staff and customers with a sling dance flash mob. We had a lot of fun rehearsing over the last week, and it was wonderful to be part of such a celebration. I will always be grateful for the invaluable help we received from Gloucestershire Breastfeeding Supporters Network during the difficult early days of breastfeeding, and Joey and I have been regulars at Sling Beat classes for the last year, so it felt very special to be part of such an event. 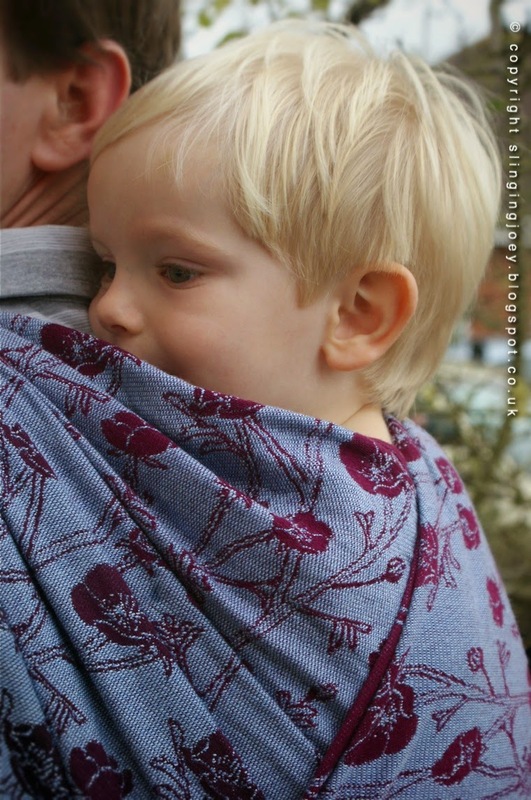 We were asked to wear pink, so I used my Artipoppe Two Birds Silvester wrap, which was perfect for the occasion. We had a really positive reaction from everyone watching the flashmob, and the video of the flash mob has since been shared around the world! Here it is if you haven't seen it yet! 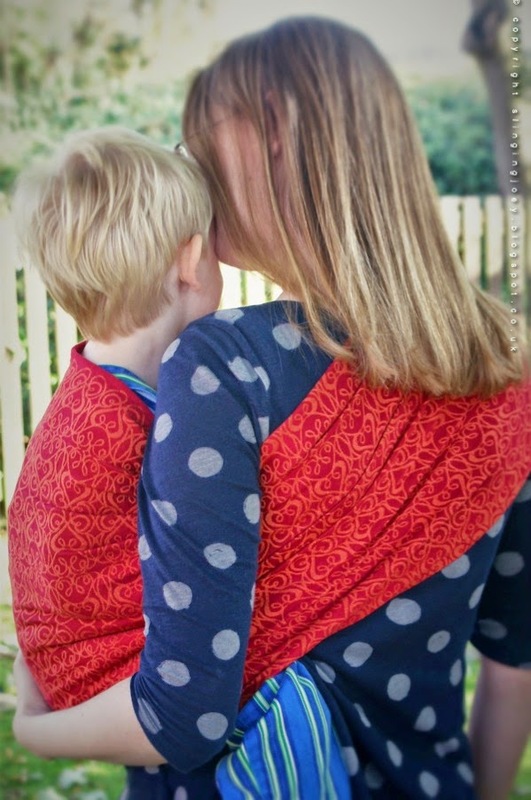 After having the genuine pleasure of meeting the lovely family behind Baie Slings last weekend at Sling Dads Camp, I was lucky enough to come away with this beautiful wrap. 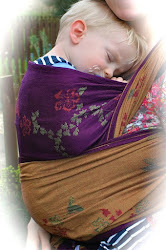 It is the second Filigree wrap that I have tried, and this one is totally different from the first! This beautiful Filigree is a combination of a fresh peachy colour and a very pale pink. 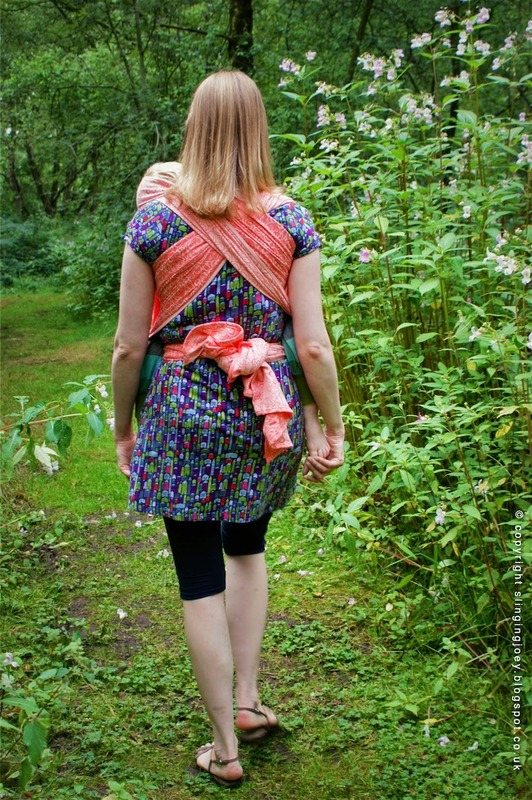 They combine to make this beautiful summery wrap. 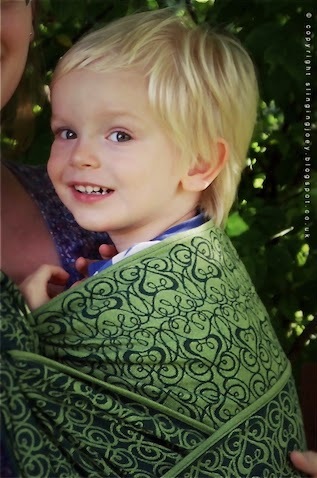 In comparison to Filigree Limerick (the green Filigree wrap) which is quite a tight weave, and requires a fair amount of breaking in, this peachy coloured Filigree is beautifully soft straight out of the bag and is a delight to wrap with straightaway. Filigree Persica is a looser weave compared to Limerick, and Juliette from Baie Slings compared it to the weave of Element Calypso. 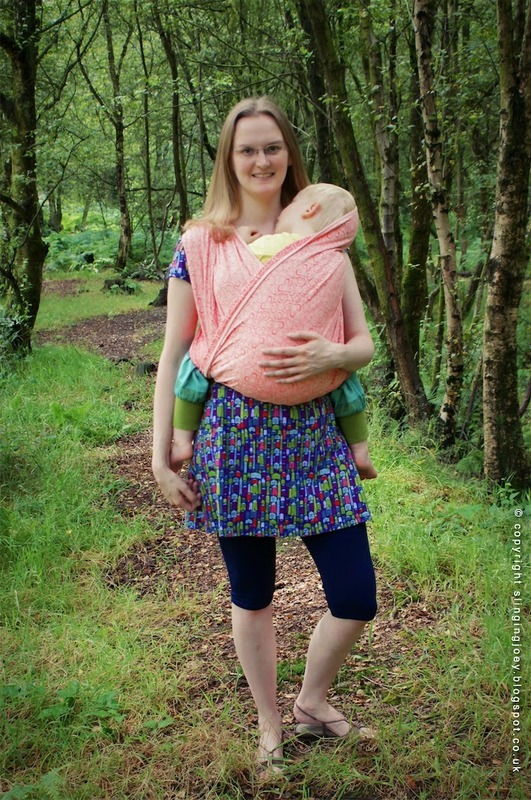 I have used this wrap a lot this week, including a couple of walks in the woods whilst still at Sling Dads Camp and an hour long babywearing dance class! It is easy to tighten and very mouldable, and even after an hour of dancing, Joey and I were still very comfortable. We also didn't feel over-heated, which in the current humid climate, is fantastic! At approx 240gsm, it is thinner than Limerick, but I found it equally supportive, partially due to the fact that it is easy to tighten and wrap accurately. Filigree Persica is fairly textured, and holds in place beautifully. 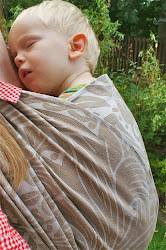 Showing the 'pale' side of the wrap. 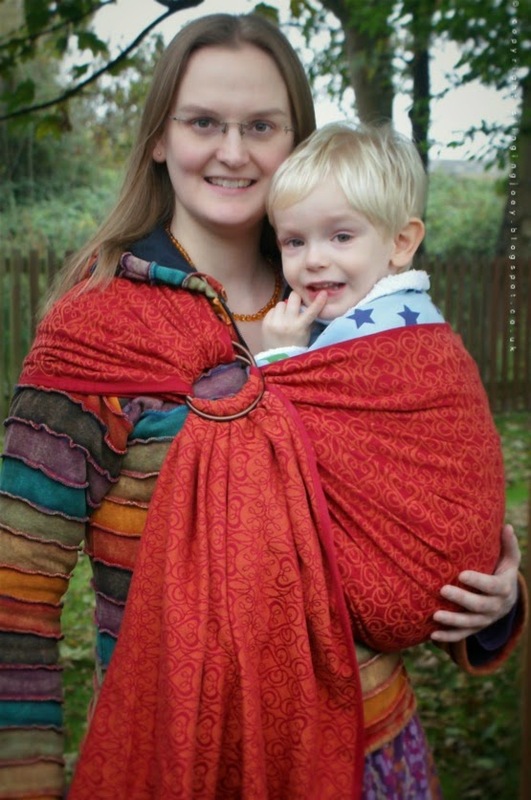 (wrap colour not shown quite as accurately). 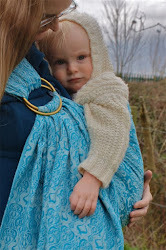 Filigree Limerick arrived along with the Trowen Jasper tester wrap a couple of weeks ago, and we have been thoroughly enjoying trying it out! Its interesting to see what effect a different weft can have on the same coloured warp, as the overall colours of Jasper and Limerick are really different, despite having the same deep green coloured warp. Limerick is actually made up of three different green colours, which combine to make this very fresh and striking colourway. This is the first time I have seen and felt the Filigree pattern in person. 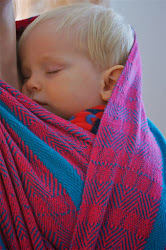 It is a really intricate, delicate pattern, and I really feel that Limerick looks equally good on either side. 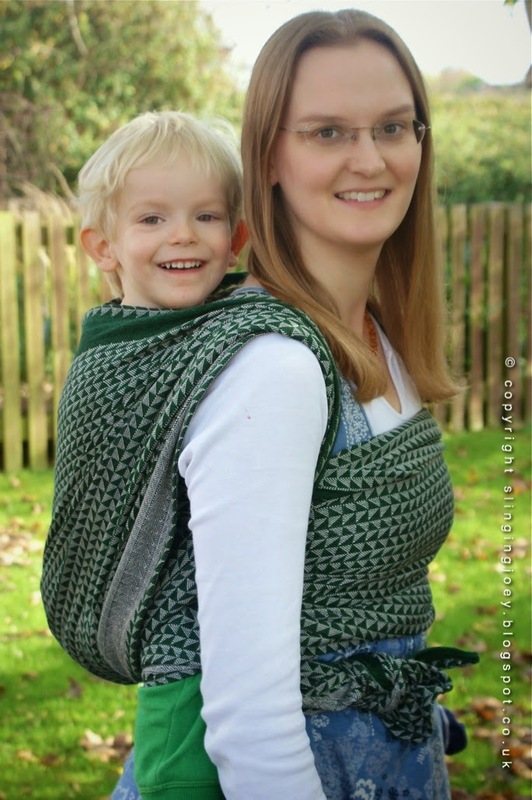 Limerick is a very tight weave, meaning it didn't arrive with the same 'fluffiness' as some of the looser weave Baie Slings. However, after a little bit of use, it is really softening up. I don't feel that its tight weave makes it difficult to use, and it is still lovely and mouldable. 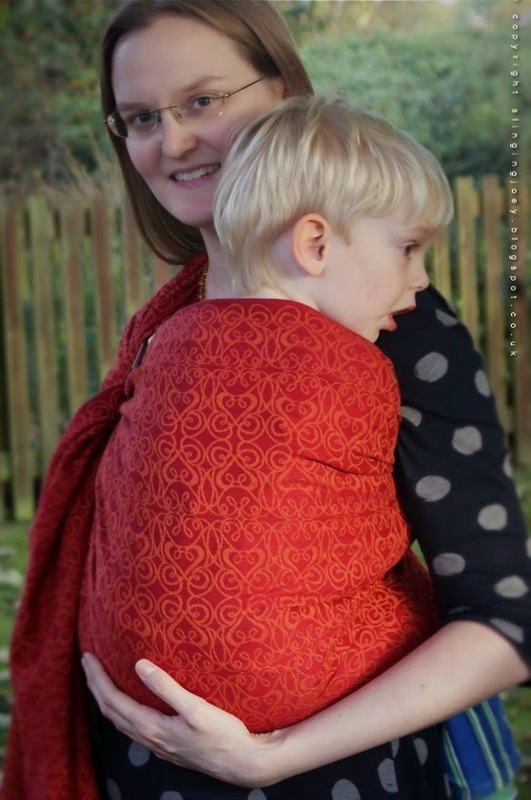 The Filigree pattern is quite grippy, so needs pulling across on a back carry slightly more carefully, but I honestly didn't struggle to get it tightened at all. 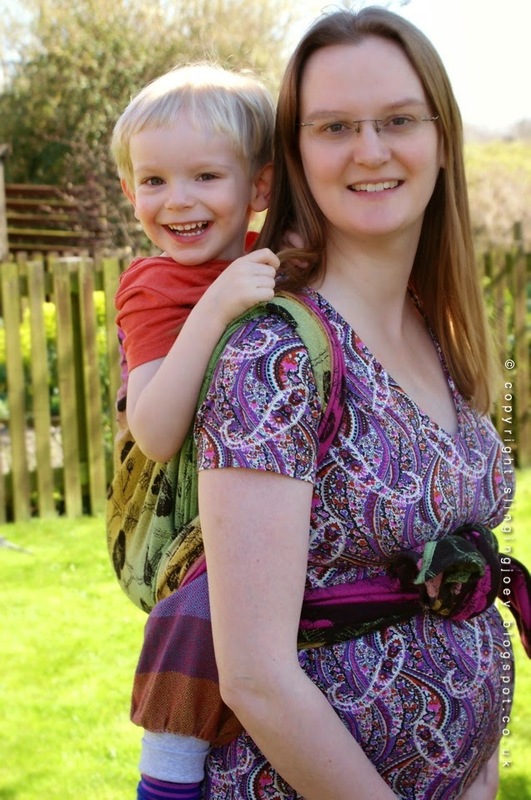 The grippiness does help everything to stay in place, and produced a really solid and supportive carry. It has less overall cush compared to some of the looser weave Baie Slings, but I didn't feel it digging on my shoulders at all. 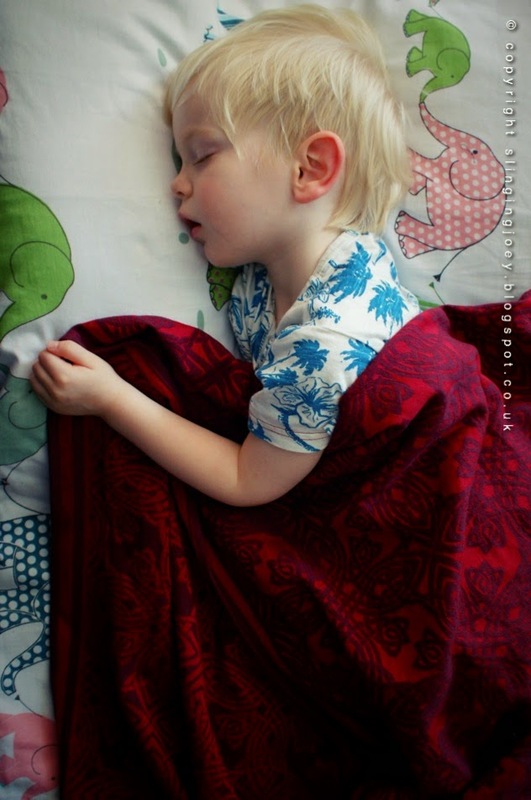 I also settled my son for his nap in a FWCC, and found it very supportive, even with such a large child. It was very easy pull into place, and the grippiness meant that the wrap staying in place whilst tightening, making it quick and easy to get into place. 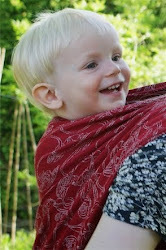 I can see Limerick getting softer with use, and I wouldn't hesitate to use with with a small baby, but it also worked beautifully with my toddler. 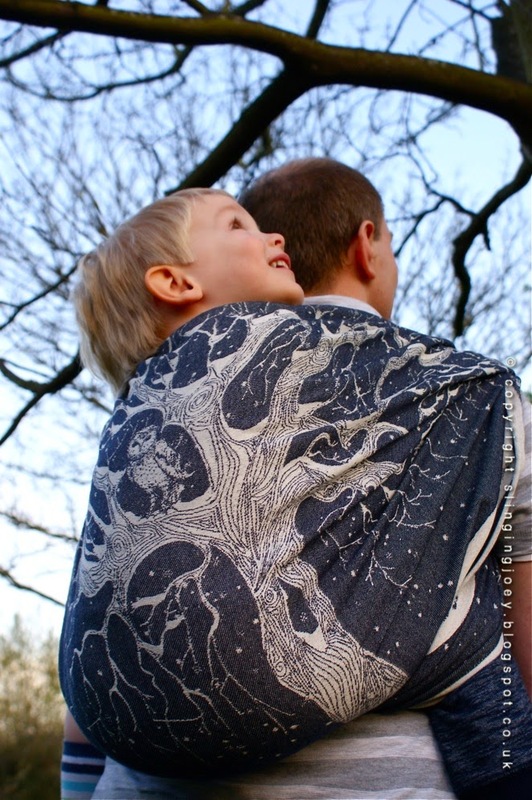 I would probably choose it in a multi-layer carry for a very large toddler, but it is supportive enough to also work in a single-layer carry for a smaller child. 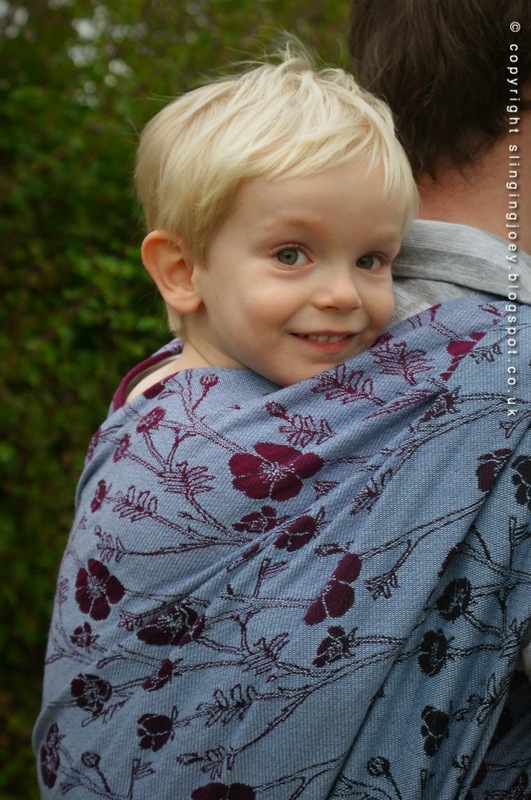 Another beautiful wrap from Baie Slings, which are being released this coming Monday. 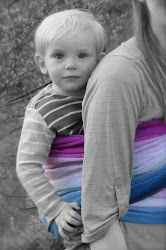 Take a look at Baie Slings website for more details! Vey close-up, showing the three different green colours that make up Limerick.